How many of you were following us a year ago? It’s hard to believe that it’s already been a year! Our core product — the TPAY blockchain — is still running strong with 2-second transaction times. We’re on track to release everything we’ve said in the original TokenPay whitepaper, and our list of accomplishments over the past year is quite impressive. Originally, the plan was to buy a bank in Vanuatu. We abandoned that idea when we received an offer to buy a bank in a superior banking jurisdiction (WEG Bank in Germany). We made a few strategic acquisitions, such as TokenSuisse, Blocksize, and TokenGaming, and have partnered with some of the leading crypto communites, like the Litecoin Foundation and Verge. 2018 isn’t over yet; we still have 1 month to go and we will be releasing some flagship products next month. The original TokenPay Wallet has been rebuilt from the ground up. We didn’t want to use other open-source solutions, so we our own. The goal is to release it for open-source sometime next year, so that other coins can integrate with our wallet. Our vision is for the TokenPay Wallet to be a simple, minimalistic, all-in-one crypto app, where we can basically plugin modules, where you could have multi-currency support, buy crypto with a credit card, find ATMs to buy and sell TPAY, locate merchants in your area that are connected with our merchant platform, swap your coins for other coins (similar to ShapeShift) and even integrate with eFIN. 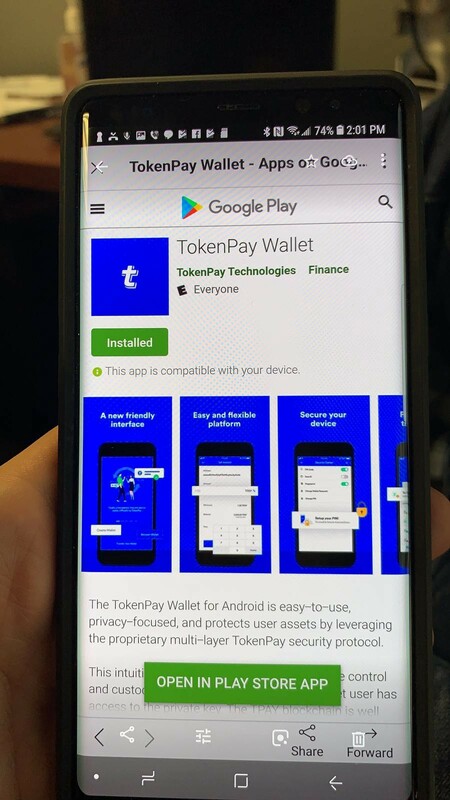 The first version of our new TokenPay Wallet will be released very shortly. It has been uploaded to the Google Play Store; we’re just putting a few finishing touches on it. It will be ready for download very soon! We have already been approved for our Apple Developer account, so now we just have to wait for Apple to approve our app. We’ve shared our vision for TokenPay and the entire ecosystem many times. To have an app like this on the App Store is an incredible achievement, and just imagine what’s coming! eFIN is the 2nd of our major releases for this quarter, and it’s one that we are incredibly excited about! Scheduled for release on December 19th, eFIN is the first ever real decentralized trading platform that directly addresses the liquidity and trading volume issue. Other truly decentralized platforms simply do not have sufficient volume, so your trades can take forever to get matched. There are several platforms out there that claim they’re decentralized, but when you read their whitepapers and dig into their tech, you’ll find that most of them aren’t truly decentralized and non-custodial. There’s a lot of smoke-and-mirrors going on in this crypto space, and we choose to be as transparent as we can with everything we do. eFIN is the decentralized hub of the entire TokenPay financial ecosystem. Every piece of our ecosystem relies on this exchange platform, like merchant services, fiat conversions and gaming. This technology will be integrated throughout the entire ecosystem as the exchange engine for all transactions. The EFIN coin directly ties into this integration by being the first coin to support Infinitesimal, which is a 2nd layer protocol that our blockchain dev division Blocksize has been working on, that will provide near-instant transaction speeds. As of right now, trades on the platform are done on-chain, so trades depend on the speed of the respective blockchains. When Infinitesimal launches next year, trades will be done off-chain, almost instantly. Here’s a screen-share video that Blocksize released for us, showing the eFIN wallet in action: https://zoom.us/recording/play/swLA3_3MpNPsgMnDZOy8sI0tIrssvpBlh8r9z0QrFBT9xc8nnR_85brXBUUttzm2?startTime=1542675359000. Our 3rd major product release this quarter is our Merchant Platform, scheduled for release on December 27. Our vision with this platform is to create the PayPal of crypto, and it directly ties into the TokenPay Wallet. Every part of our ecosystem is interconnected. We’ve been focused on making this platform simple and easy-to-use. When the product is ready for release, we’re going to focus on merchant onboarding. Getting as many merchants signed onto our platform as possible, accepting TPAY, is a monumental move in adoption and brand recognition. Even with how strong our community is, people still don’t know who we are. Next year, that changes. It’s not staged at all. This is why we say that we’re so early. People just don’t know what Bitcoin is. Have you ever tried to explain to one of your non-tech friends or family members what Bitcoin is? It’s not the easiest thing. They think it’s magic computer money or an outright scam. It’s why we so heavily believe in adoption and true usage cases. While we are early, we are also positioning ourselves to be in the right place to absolutely dominate the market when real adoption begins. We have such a strong community, and we owe everything we have to you guys. Literally, without you, we wouldn’t be here. We love to be able to give back to our community, which is why we are so active in our social media channels, and we listen to your feedback, both positive and negative. We wanted to do something extra special, so we put 2,000 TPAY into a wallet and announced the first-ever TPAY Treasure Hunt. We gave away the wallet address and we posted daily clues to unlock the private key. Originally, the plan was to announce the final clue on our monthly livestream call on YouTube, but as it turns out, one of our community members outsmarted us and was able to figure out the rest of the private key on their own. Congratulations! We will definitely be doing more of these in the future. It was a lot of fun, and it was a great way to give back to the same people that tirelessly support us. We’re weeks away from releasing CryptoBet! We’re busy doing some deep integrations with our gaming providers. It’s not a plug-n-play solution; it requires a lot of behind-the-scenes tech work to integrate these providers into our blockchain. These integrations are crucial to power the completely automated payouts. This has been a huge undertaking to develop, but automated wallet-to-wallet payouts completely remove the payment delays when you have to wait for somebody to manually approve and process your payout. You’ll be able to initially deposit in TPAY, LTC, BTC and XVG. All deposits are converted into mBTC, and you’ll be able to play hundreds of different casino games, table games, live dealers, sports betting, and more. Launching in December! For the past several months, we (well, primarily our devs at Blocksize) have been working secretly with the developers at a prominent Chinese crypto exchange called BitForex. We have been working on a custom integration of TPAY with USTD and BTC. This month, this listing was finally launched. The first few hours of TPAY trading at BitForex brought several hundred thousand dollars in volume. This is the type of liquidity that we need in preparation of the launch of our highly anticipated TokenPay Merchant Payments Platform! The $TPAY Blockchain Explorer has been updated at https://explorer.tpay.ai/. In 2019 we will release a completely new and enhanced Explorer. Currently, we have 2 full-time blockchain developers working exclusively on the TPAY blockchain along with an industry-leading consultant. Stay tuned for December! Next month is going to be ABSOLUTELY EPIC! TokenPay Ecosystem Report — November 2018 was originally published in TokenPay on Medium, where people are continuing the conversation by highlighting and responding to this story.